Digitization creates major opportunities for financial services – automating operations, expanding channels, delivering engaging customer experiences. There are corresponding challenges – unprecedented data and transaction volumes, channel control in electronic marketplaces, and preventing fraud when the fraudsters are technologically adept. 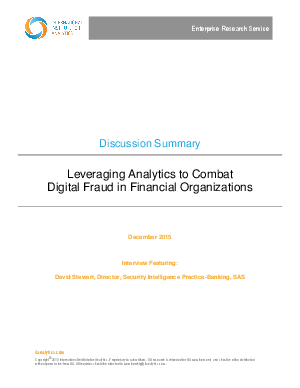 To discuss the opportunities, challenges, and solutions around financial fraud in the digital age, IIA spoke with David Stewart, Director, Security Intelligence Practice-Banking at SAS Institute Inc.